Ford back in a big way for 2016 Le Mans 24hrs. Ford has just announced their new race car for the 2016 season. The car is based on the all-new Ford GT supercar which was unveiled in January. The production car and race car will arrive in 2016 and will celebrate the 50th anniversary of Ford GT race cars coming 1-2-3 at the 1966 24 Hours of Le Mans. 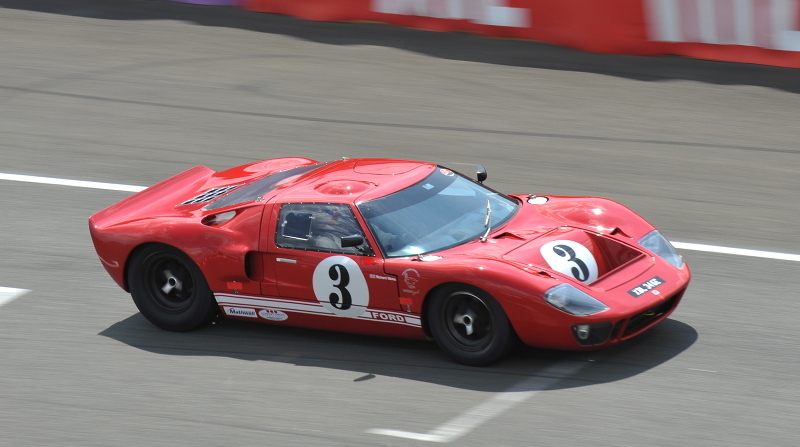 Ford then went on to repeat that victory at Le Mans in 1967, 1968 and 1969. Ford has a busy programme lined up for 2016. They will run a full season in the FIA World Endurance Championship and the TUDOR United SportsCar Championship. It debut will be at The Daytona Rolex 24 hrs. The new Ford GT race car will run the full 2016 schedules of the FIA World Endurance Championship and TUDOR United SportsCar Championship, making its competition debut in January 2016 in the Rolex 24 at Daytona, Florida. The two Ford teams will be operated by Chip Ganassi Racing with Felix Sabates (CGRFS). However their main target will be returning to Le Mans so both series teams intend to compete with a four-car effort. Drivers have yet to be announced. The new car will be built to meet the new 2016 LM GT Pro regulations. At first glance the rear diffuser looks massive, but maybe this will meet the new regulations.It will be s test bed for the company’s aerodynamics and lightweight carbon fibre construction. Power comes from a new twin-turbocharged Ford EcoBoost® V6, making it the most powerful EcoBoost production engine ever. They will certainly get a great reception when they arrive back at La Sarthe! Works teams - why does it matter? The classic expression “Race on Sunday, sell cars on Monday” must still be true. Looking at the investment the big hitters have made this year, you have to believe they are not here for the benefit of their health. Take Porsche for instance, they have three race cars here in their current attempt at winning this classic race. It would be their first overall victory here at Le Mans since 1998 (Aiello, McNish and Ortelli driving the Porsche GT1). Their first win was in 1970 with the Hans Herrmann and Richard Attwood driving a 917. The ACO records show that there have been a total of 770 Porsche entries at Le Mans which is a record in its own right, 382 of those have finished in the points. Their best year was 1971 when Porsches occupied 33 places on the 49 car grid. This year, in addition to the three race cars, they have brought along a spare chassis, six engines, six gearboxes, six ‘rear’ gearboxes, nine front wings, nine rear wings, 80 wheels, 120 radios and headsets, 120 team members (engineers, mechanics, and team management. This does not include Porsche communications people, marketing staff, sponsorship support and of course driver support. Almost every building in La Sarthe seems to carry Porsche branding somewhere. Even their VIP Shuttle cars are Porsche Cayennes. They will also be thinking about the world TV coverage of millions and maybe even the 263,300 spectators that came to watch in 2014. We think they might be taking this seriously. So what about Audi? The Audi Group delivered around 1,741,100 cars in 2014. This generated a revenue of €53.8 billion. Way back in 1980 Audi burst onto the rally scene with the incredibly technically advanced Audi Quattro and its huge success in motorsport did Audi’s image no harm at all and boosted their road cars sales massively. 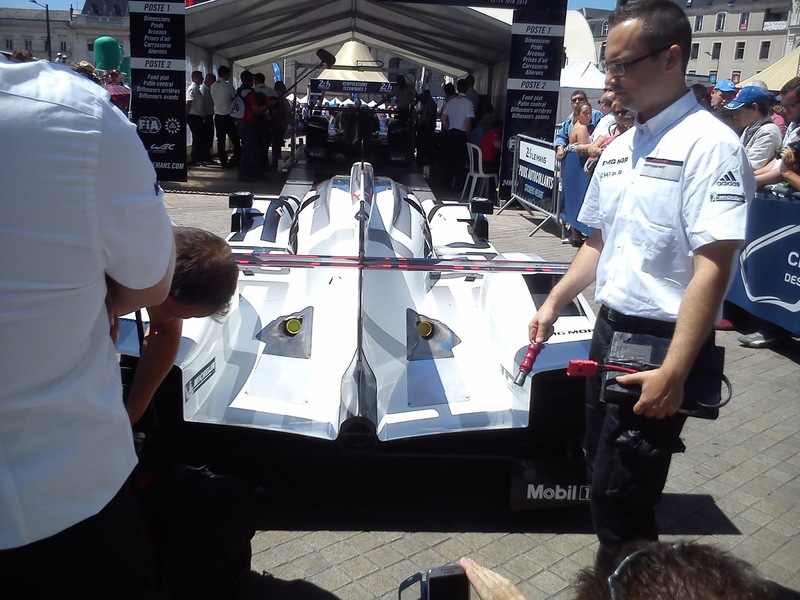 Audi have always used Le Mans as a technological showcase for their amazing diesel and hybrid developments. In 2006 they were the first manufacturer to win with a diesel fuelled car, then by 2012 they were the first manufacturer to win with hybrid technology. They tell us that in 2015 none of the other manufacturers will consume as little fuel as Audi. Their e-tron technology can now be found on the Audi A3, A4 and A8. Dr Wolfgang Ulrich says “This efficiency perfectly matches the ‘More from less’ formula’ which is Audi ultra’s take-home message’" Audi plan to invest around €24 billion between 2017-2019 primarily in new products and sustainable technologies. Their long term goal is CO₂ ‘neutral’ mobility. So, like Porsche, they clearly see massive value in their ongoing Le Mans involvement and successes. Audi Sport Team Joest is being run by the legend that is Reinhold Joest who has been responsible for 15 overall victories here at Le Mans. They are committed to come back next year, after that who knows. Have Toyota lost the plot? Over the last 30 years Toyota have raced at Le Mans 17 times. Up until last year 40 separate cars have raced here. They visited the podium in 1992, 1994, 1999 and 2013. They picked some star drivers over the years like Alan Jones, Eddie Irvine and of course three-time Le Mans winner Allan McNish. However they have never won the race outright. This year they have Buemi, Davidson and Nakajima in the #1 car and Wurz, Sarrazin and Conway in the #2 car. There is a nice connection that it was Nakajima’s father, Satoru, who drove the car back in 1985. Toyota have always been committed to motor sport to develop their technical and sales image. They were successful in International Rallying for several years. They have of course led the way with hybrids like the Prius which can claim to be the first ‘mass market’ hybrid. So this links in well with their current race ambitions. So far this season has not gone to plan and the cars still seem to be off the pace despite their best efforts to close the gap on Audi and Porsche. But as the pundits often remind us ‘24 hours is a very long time to race’.. Imagine 12 F1 GP’s run back to back flat out. So while they don’t maybe have the sheer pace of the other big hitters they may well be back on the podium if the Audis and Porsches suffer from reliability problems . But they can’t make any mistakes at all ! Finally where are Nissan heading with their GT-R LM Nismo? This is really is a highly innovative bit of machinery but to be honest it may be here at Le Mans a year too soon. It is a remarkable bit of kit that should have arrived as a hybrid and with four wheel drive, but it has arrived here with a hybrid system that isn't working and only two wheel drive, which is not ideal. The car really is ground breaking when you think back to the last front wheel drive car to race at Le Mans, the Mini Marcos which finished 15th in 1966. Some cynics suggest that Nissan will do well to get their cars to the finish and match the result recorded by the little Marcos. It definitely has the top speed in a straight line that can match any of the big three.. it is the corners that present them with a bit of a problem. Manufacturers are here to sell cars, get exposure for their brand and to explore future technologies. It is a very expensive way of doing things but it is a well-trodden path over the entire history of the 24 hours since 1923. Free practice and qualifying on Wednesday and Thursday evening at Le Mans are almost always an exciting spectacle. The fireworks started early. In his first flying lap of qualifying, Swiss driver Neel Jani in the #18 Porsche 919 hybrid posted a time of 3:16.887 beating the previous qualifying record of 3:18.513 set by Stéphane Sarrazin in 2008 in a Peugeot 908 HDi FAP. Throughout practice and qualifying, many drivers were warned of track limits abuse, particularly at the Ford chicane and Tertre Rouge. The #71 AF Corse Ferrari had 6 lap times deleted as a result of repeatedly taking liberties. At about 11pm, Paletou driving the Greaves #41 Gibson Nissan spun into a barrier at Mulsanne corner bringing out a red flag for 20 minutes. Patterson in Murphy Prototypes #48 Oreca had an accident in free practice but the team did an excellent job and the car was repaired in time to take part in the final twenty minutes of 1st qualifying. Finally Townsend Bell in the Scuderia Corsa #62 Ferrari went off at Mulsanne and brought out another red flag and the session was not resumed. Porsche set the top three times of the session in P1, In P2 it was Richard Bradley in KCMG #47 Oreca fastest, and in GTE Pro, Stanaway in the #99 Aston Martin. In GTE Am Lamy in the Aston Martin #98 who set the fastest lap time. The second qualifying session on Thursday started under hot and humid conditions with thunderstorms threatening. Lap times were not much improved from Q1 and the white line police were very active. Many drivers were repeatedly reprimanded for not staying within the limits of the circuit. At 7:35, Dominik Kraihamer driving the the Rebellion #13 went off at the first chicane on the Mulsanne straight, damaging the nose of the car. A few minutes later, Cameron in the #55 AF Corse Ferrari went into the gravel at the Porsche curves, bringing out a red flag. Buemi in the #1 Toyota, while making his way back to the pits under red, did a strange slow motion pirouette at Arnage and continued. The track went green again at 7:50. Jan Magnussen driving Corvette #63 had a spectacular accident at 8:25pm in the Porsche curves which damaged the car sufficiently that it has been withdrawn from this year's race. The incident brought out the red flag and the session was not resumed. The top 3 times overall in all classes were not improved from Q1, except Tandy in #19 Porsche who improved slightly but remained 3rd fastest. Q3 started 30 minutes early at 9:30pm to make up for the shortened Q2. At 10:15 Dala Lana in Aston #98 went off at Mulsanne and a slow zone was in force for a while. At 10:40 Hirsch in the #41 Greaves Gibson also had an excursion at Mulsanne. At 11pm the #67 Team AAI Porsche came to rest just before the first chicane with it's rear end on fire. Driver Alex Kapdia was extracted and the conflagration doused. This brought out another red flag for half an hour until 11:30. After the restart there were more problems for the #41 Greaves when the front fell off after Dunlop chicane and the damaged car was driven slowly by Gary Hirsch back to the pits. Although the three Nissan LMP1 cars set better times than the LMP2 field, they will start from the back of the prototype grid because they failed to reach 110% of the LMP1 pole time. The #71 Ferrari that was 4th fastest in GTE Pro will be sent to 2nd to last on the grid because one driver failed to meet the 120% criterion. The ByKolles CLM was also demoted to 29th on the grid for similar reasons. This may still be subject to appeal because we have not yet seen an official statement of the starting grid. The rain held off for the full session, but lap times were not improved on Q1 and Q2. driver changes on Tuesday afternoon. Since the early years, but mainly since WW2, there has been a long and distinguished history of American cars and drivers competing in the 24 Hours of Le Mans, many scoring overall wins and often multiple overall success. 18 Americans and 2 Canadians are among the total of 168 drivers in this year's race. Davy Jones 1996, Hurley Haywood 1977/83/94, Price Cobb 1990, Al Holbert 1983/86 Bill Whittington 1979, Don Whittington 1979, Dan Gurney 1967, AJ Foyt 1967, Masten Gregory 1965, Ed Hugus* 1965, Phil Hill 1958/61/62, Carroll Shelby 1959, Luigi Chinetti* 1949. *Ed Hugus was not credited as a winning driver by the ACO, but maintained that he did drive the car when Masten Gregory had vision problems in the early morning while Jochen Rindt was taking his break. This is controversial because the only currently living person who was there at the time is Chinetti Jr and he says it didn't happen. Hugus was no stranger to Le Mans and was a softly spoken man not prone to 'line shooting', so we are disposed to give him the benefit of the doubt. In his words; "Masten got out of the car and said 'Goddam fog, I can't see. With my eyesight I'm afraid I'll run off the road', Rindt was nowhere to be found so Luigi turned to me and said 'Get your hat and go.' I only drove six laps I think, then I came back in and Rindt took over." *Chinetti was for all intents and purposes an American, but he was not officially naturalised until March 1950, however he had already applied for citizenship in '49 and had lived in the USA for many years. It is therefore right to include him in the list. This year there are eight drivers here who have competed in major American open wheel series. Don't forget to download your Andy Blackmore spotters guide to Le Mans 2015 and also the Club Arnage guide , cheat sheet and driver data . The second day of scrutineering and driver sign-on began at 10:00 with the two Team AAI Porsches who are here with invitations due to their success in the GTC class of the Asian Le Mans series. There is no GTC category at the 24 hours, so they are here with LMGTE Am Porsches. Following them through pesage were the two Oak Racing Ligier JSP2, the #34 powered by HPD and #35 by Nissan. The carnival atmosphere in the Place de la Republique continued, although perhaps slightly fewer spectators (this being a weekday) and the main contingent of race fans not yet here. The sun continued to shine as the drivers of SMP racing mingled with autograph hunting spectators. I do wish the Ladygin brothers would get different haircuts or something, I find them quite hard to tell apart! The cloudless blue sky continued over the one hour lunch break after which the Porsche 919 hybrids turned up, followed by the Signatech Alpine and the Aston Martins including the #97 Art Car which puts us slightly in mind of a BBC test card from about 1975, seen on a poorly maintained television. One thing is certain, you'll not mistake it for anything other car on the track! The armada of AF Corse Ferraris followed the pair of works Corvettes and last of all the Krohn Racing Ligier JS P2 that was wheeled under the scrutinous gaze of the ACO officials. All 56 cars were finally passed as fit to race, as well as the 168 drivers. That is it then from scrut' or pesage or tech inspection whatever you are accustomed to calling the process. The week starts properly on Wednesday afternoon with first free practice session from 16:00 to 20:00 when the talk stops and the racing begins! In the meantime, tomorrow there is the official group photo of the 168 drivers at 11.30 and then at 17:00 the drivers will be signing autographs in front of the pit garage in the pit lane which will be open to anyone with an Enceinte Générale (general admission) ticket. The Club Arnage team will be 'enlarged' tomorrow with the arrival of messrs Simpson and Sorth, and Jock will (with the incentive of beer and merguez) be blogging the rest of the week. Don't forget to download your spotters guide to Le Mans 2015 and also the Club Arnage guide and cheat sheet. Tonight we are raising a glass to our fallen comrade David Stephens tonight; a well known and much loved photographer who signed off suddenly yesterday at a relatively tender age. Daily Sportscar have a touching tribute to him on this link. The Strakka Dome was first through the pesage process. I have to admit to (personally) being a bit equivocal about the whole 'pesage' thing, mainly that not much ever happens. That said, it is hugely popular with the local population of Le Mans who always turn out in impressive numbers to watch the cars do their slowest lap of the week around the various tents set up around the Place de la Republique where cars are weighed, measured and inspected for safety and compliance with regulations. In 2014 it was a cold and soggy affair but this year the soleil has his chapeau on and the crowd have parasols up for shade rather than shelter. The KCMG Oreca 05 is pushed into the first stage of 'verification'. scrutineering, there is an area where team pictures are orchestrated for the assembled photographers. Drivers and team managers are then invited to the main stage where they are interviewed by the effusive French commentator Bruno Vandestick and the somewhat more measured tones of David Waldron. Drivers generally say how happy they are to be here and how competitive and optimistic they are. At least one will say that "24 hours is a long time". A good time will be had by all, and the good people of Le Mans plus a few early arriving race fans from further afield will have had one of the closest encounters with cars and drivers of the 24 hours of the entire race week. Today was a half-day from 14:00 to 18:00 but tomorrow will be a full on 10:00 to 17:00 of pesage fun and frolic that starts with the two LMGTE Am Team AAI Porsches and finishes up with the distinctive lime green LMP2 Krohn Racing Ligier JS P2 - Judd.